South Korea said Friday it will hold another round of negotiations with the United States next week on sharing the cost of stationing American troops on the peninsula. It would mark the 9th round of negotiations the Special Measures Agreement. 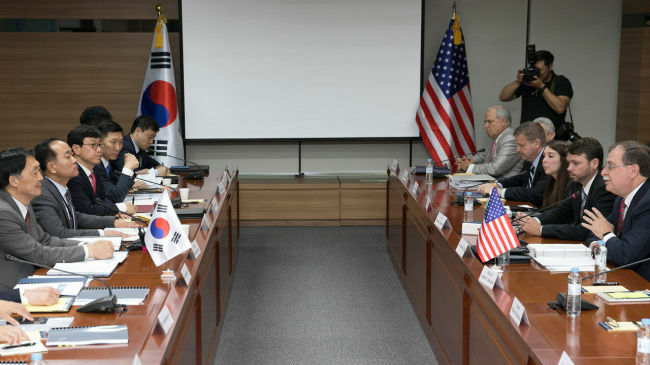 "South Korea and the US plan to have in-depth consultations to coordinate their stances on the basis of what was discussed in the previous session," the Ministry of Foreign Affairs said. Washington has called for Seoul to significantly increase its contribution from the current 960 billion won ($851 million) a year to support the stationing of the 28,500-strong US Forces Korea. The US wants South Korea to pay, at least partly, for the regular or emergency deployment of so-called strategic assets to Korea. The assets include advanced US weapon systems, such stealth fighters, aircraft carriers and nuclear subs.